Henry Bernard was born in April 1866 in Texas. His father was born in Ireland and his mother in Texas, but no additional information is available on them. Circa 1891 Henry married Carlota Holguin, who was born in Mexico circa 1872. In 1900 the couple was living in Presidio County in the Alamito area, referred to as Dysart Village in the 1900 Census. Henry was employed as a stock raiser according to that census. By 1902 Henry, Carlota and family had relocated to Southern Brewster County, probably Lajitas initially, but later to the Terlingua-Study Butte areas. Tax records suggest Henry was in the ranching business in 1903. In that year he owned 40 horses or mules and 50 cows. Over the next few years he disposed of many of the horses or mules and all of the cows. By 1908 he owned 10 horses or mules and 2 wagons, suggesting he had gone into the freighting business. Carlota probably died in 1910 because of lingering complications from the birth of son Francisco. Soon afterward Henry and his family moved to Imperial, Texas, where Henry owned and operated a general store. Henry died in Imperial May 7, 1945 and is buried in Buena Vista Cemetery, about 5 miles southeast of Imperial. Sometime after his arrival in Imperial, Henry married Antonia Jaquez. She was born in 1879 and was the daughter of Cesario Jaquez and Concepcion Tercero. Antonia was the widow of Silvestre Holguin (b), born in 1874. He was the son of Luciano Holguin and Luciana Lugo. Antonia and Silvestre were married August 12, 1898 in Jesus Nazareno Church in Ojinaga, Chihuahua, Mexico. They had three children, sons Silvestre and Luciano and daughter Juliana, all of whom married children of Henry Bernard and Carlota Holguin. A. Valente Bernard was born on July 28, 1932 in Pecos County, Texas. 2. Daughter Teresa Bernard was born in June 1893 in Texas. In 1900 she was living with her parents in the Alamito area of Presidio County. No additional information is available on Teresa. 3. Daughter Bessie Bernard was born in November 1894 in Texas. In 1900 she was living with her parents in the Alamito area of Presidio County and in 1910 with her parents in the Terlingua area. No additional information is available on Bessie. 4. Son Henry Bernard was born in September 1895 in Texas. In 1900 he was living with his parents in the Alamito area of Presidio County and in 1910 with his parents in the Terlingua area. No additional information is available on Henry. (1). Daughter Enedina Urias was born February 5, 1941 in Fort Stockton and died there of gastro enteritis August 2, 1941. She is buried in Fort Stockton. (2). Son Roberto Urias was born July 17, 1942 in Fort Stockton. (3). Daughter Hermelinda Urias was born March 29, 1946 in Fort Stockton. (4). Daughter Vaudelia Urias was born February 13, 1949 in Fort Stockton. (5). Daughter Lupe Maria Urias was born January 27, 1952 in Fort Stockton. (6). Son Jesus Ricardo Urias was born October 3, 1953 in Fort Stockton. Roberto Barron Urias married Maria Pena October 10, 1966 in Imperial, California and they had six children. Roberto died in Riverside California July 3, 1989. B. Son Pedro Bernard Gonzalez was born October 23, 1915 in Texas. He served in the U.S. Military from 1944 to 1945 and later worked as a self-employed truck driver. He died May 9,1974 in Brooke General Hospital, Fort Sam Houston of complications of 3rd degree burns over 23% of his body. The burns were sustained during a vehicle fire reportedly caused by smoking in the vehicle. He is buried in Fort Stockton. Pedro’s wife’s name was Teodula. C. Son Manuel Gonzalez was born on June 16,1933 in Pecos County, Texas. 6. Daughter Carlota Bernard was born in March 1900. Nothing more is known about her. A. Daughter Rosea Holguin was born in Pecos County November 19, 1934. B. Son Silvestre Holguin was born in Pecos County July 17, 1937. C. Son Manuel Holguin was born in Pecos County June 17, 1939. D. Daughter Hermelinda Holguin was born in Pecos County August 22, 1941. (1). Daughter Amelia Holguin was living in Louisiana in November 2010. Her married name is Benavidez. (2). Son Eddie “Lalo” Holguin. A. Daughter Faustina Bernard was born July 29, 1927 in Imperial. 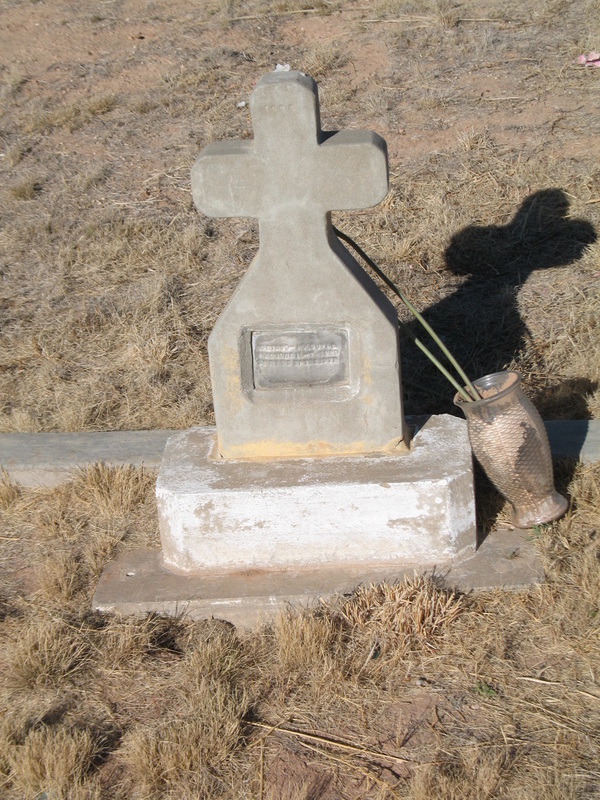 She died in Bell Hospital, Monahans of rheumatic fever on April 14, 1951 and is buried in Monahans Memorial Cemetery. She was employed as a clerk in a lumber office prior to her death. B. Daughter Gloria Jaquez Bernard was born on July 12, 1932 in Pecos County, Texas. C. Daughter Maria Bernard was born on September 28, 1934 in Pecos County, Texas. (1). Daughter Roxanne Bernard married Jaime Tavarez. In December 2009 they were living in Odessa, Texas. (2). Daughter Michelle Bernard married Gabriel Casillas. In December 2009 they were living in Odessa, Texas. E. Son Juan Bernard was living in Odessa in December 2009. F. Daughter Victoria Bernard was living in Odessa in December 2009. Her married name is Navarrete. 9. Daughter Margarita Bernard was born on March 8, 1907 in Texas. She was baptized on May 2, 1907 in Terlingua, Texas by Father Brocardus from St. Joseph’s Catholic Church in Fort Davis. Her godparents were Francisco Jaquez and Nieves Samaniego. In 1910 she was living in the Terlingua area with her parents. Circa 1937 she married Luciano Holguin, the son of Silvestre Holguin and Antonia Jaquez. Margarita died December 16, 1987 and Luciano died March 15, 2000. Both are buried in Imperial Cemetery. (1). Daughter Sally Holguin was living in Carlsbad, New Mexico in November 2011. (2). Daughter Carolyn Holguin was living in Midland in November 2011. (3). Daughter Dorothy Holguin was living in Kermit, Texas in November 2011. At that time she was serving as District Attorney for Kermit and Crane. (2). Son Gustavo Holguin, Jr.
C. Daughter Zenaida Holguin was born on 5 June 1938 in Pecos County. In May 2002 she was living in Lovington, NM. Her married name is Aranda. D. Son Henry Holguin was born on 1 March 1940 in Pecos County. In May 2002 he was living in Odessa. a. Son Christopher Shawn Daniels was born February 8, 1987 in Big Spring. In November 2011 he was living in Forsan. b. Son Bradlee Wayne Butts was born June 2, 1993 in San Angelo. In November 2011 he was living in the Atlanta area. c. Daughter Shelby Marie Strobel was born August 5, 1998 in San Angelo. In November 2011 she was living with her parents in the Atlanta area. a. Son Seven Van Holguin was born March 25, 1998 in Prescott, Arizona. F. Daughter Margarita Holguin was born on 16 February 1944 in Pecos County. In May 2002 she was living in Imperial. Her married name is Acosta. (1). Son Salvador Holguin, Jr. was living in McCamey in May 2002. (2). Son Carlos Holguin was living in Huston in May 2002. (3). Daughter Helen Holguin was living in McCamey in May 2002. (4). Daughter Ana Holguin was living in McCamey in May 2002. H. Son Cipriano Holguin was living in Odessa in May 2002. I. Son Luciano Holguin was living in Odessa in May 2002.
a. Son Tapley Holguin was living in New Jersey in November 2011.
a. Son John Stephen Hasak was born in Cape Coral, Florida February 1, 1990. In November 2011 he was enrolled in University of South Florida in Tampa. a. Daughter Porsha Tanishe Kimble was born circa 1980 and in November 2011 was living in the Dallas-Fort Worth area. (4). Son Ramon Bernard Holguin, Jr. was born May 14, 1964 in Big Spring. In November 2011 he was living in Forsan, Texas. He never married. (1). Daughter Cecilia Bernard married Joel Martin and in April 2009 they were living in Midland. (2). Daughter Maria Christina Bernard married Juan Ochoa and in April 2009 they were living in Midland. (3). Daughter Corina Bernard married Mario Pena. He was deceased by April 2009. Corina was living in San Angelo in April 2009. (4). Son Rudy Bernard and his wife Lida were living in Harker Heights, Texas in April 2009. (5). Daughter Loraine Bernard married Clayton Pratt and they were living in Temple, Texas in April 2009. (6). Daughter Carolyn Bernard married Billy Allison and in April 2009 they were living in San Angelo. (7). Son Arturo Bernard, Jr. was born February 3, 1955 in Kermit. He died in Ward Memorial Hospital October 19, 1958. He is buried in Monahans Memorial Cemetery. a. Son George Frank Bernard was born in 1975. C. Daughter Carlota Bernard was born 11 September 1934. She married Miguel Reyes. In April 2009 they were living in Midland. D. Daughter Bessie Bernard was born 17 October 1936 in Imperial. She died 18 November 1936 in Imperial and is buried in Buena Vista Cemetery. E. Daughter Elodia Bernard was born 4 July 1938. She married Roy Rubio and in April 2009 they were living in San Angelo. F. Daughter Teresa Bernard was born 2 Dec 1940 in Imperial. She died 8 February, 1941 in Imperial of measles and is buried in Buena Vista Cemetery. G. Daughter Maria Refugio Bernard was born 15 March 1942. She died 19 May 1943 of a middle ear infection in Fort Stockton, where he parents apparently had taken her for medical attention. She is buried in Buena Vista Cemetery. (1). Son Albert Sotelo, Jr. was living in Monahans in August 2011. (2). Son Eddie Joe Sotelo was living in Monahans in August 2011. (3). Daughter Sylvia Sotelo was living in Monahans in August 2011. Her married name is Almanza. I. Daughter Elvira Bernard was born 21 May 1946. She married Sergio Hernandez and in April 2009 they were living in Monahans..
J. Daughter Lucia Bernard was born 26 September 1947. She married Adolfo Chavez. They are divorced. Later she married Rey Martinez and in April 2009 they were living in Monahans. K. Daughter Elisa Bernard was born 15 January, 1949. She married Apolinar Martinez and in April 2009 they were living in Monahans. L. Daughter Bessie Bernard was born 4 September, 1950. She married Jose Angel Vargas and in April 2009 they were living in Monahans. M. Son Francisco Bernard, Jr. was born 30 March, 1952. His wife’s name is Ramona and in April 2009 they were living in Monahans. (a). The information on baptisms is based on records from St. Joseph's Catholic Church, Fort Davis, which was the home church of the priest who visited the South County area about twice each year. For the first 6 years the only southern Brewster County locations shown in the records were Terlingua, Lajitas and San Vicente. In 1906 "Bigbend" started to appear, referring to the Study Butte area, and in 1908 "Chisos" started to appear, obviously referring to present-day Terlingua. Until about 1910, Terlingua was at the Mariposa Mine area. (b). No apparent relationship to Carlota Holguin. Family history information provided by George Frank Bernard, Loraine Bernard, Cecilia Marin, Silvia Hasak, Ayda Pena-Perez. Marriage records from Jesus Nazareno Church in Ojinaga, Chihuahua, Mexico, accessed via the FamilySearch web site.